This book is ecumenical, interreligious, and metareligious in nature. It may have a provocative title, but it is the subtitle that says what the book is really about. The book is not simply an attack on religion, but offers ideas for improving religion, any religion. It defines what makes a true religion, in the most positive meaning of the term, and what makes a cult, in the most negative meaning. Rather than just pointing fingers, however, the book introduces the six criteria that make a religion, even a minority religion a true religion, and these ideas can be used to improve every religion by its believers, or by those who are priests, monks, rabbis, mullahs, religious people of any kind, or theologians. This book is for everyone, with religious ideas applicable to all religions, even Islam - in fact, the author justifies the applicability and necessity of the book by citing both the Qur'an and Muhammad. 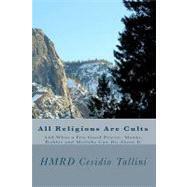 This book can increase or promote interreligious dialogue, and in a way that does not offend anyone in particular. It could also give new lustre to all religions with followers and clergy with an open mind.